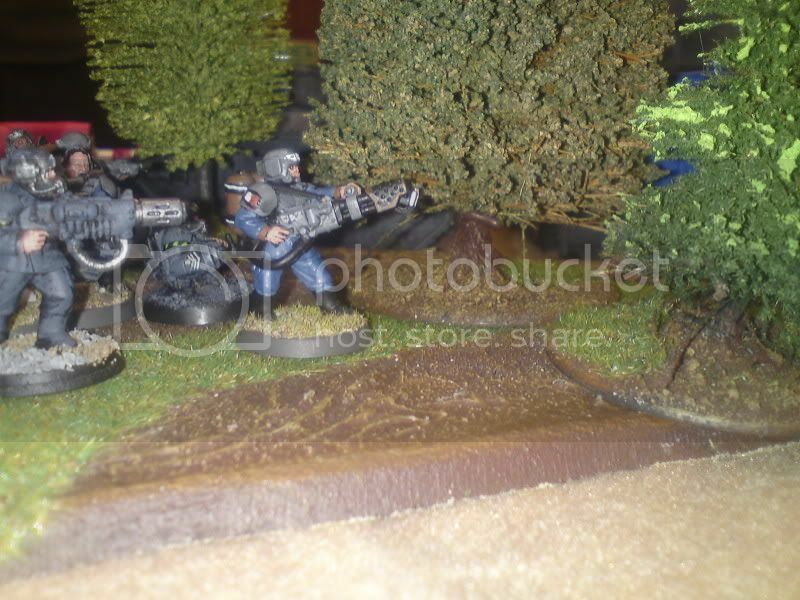 The objective fell into a wood on the LHS of the board (my perspective) The armoured might of the Guard rumbled towards it at high speed whilst shooting up a squad of daleks and a heavy destroyer. Return fire from the daleks did nothing, but a leman russ juddered to a halt in a crater that was clearly too difficult to drive a tank through! 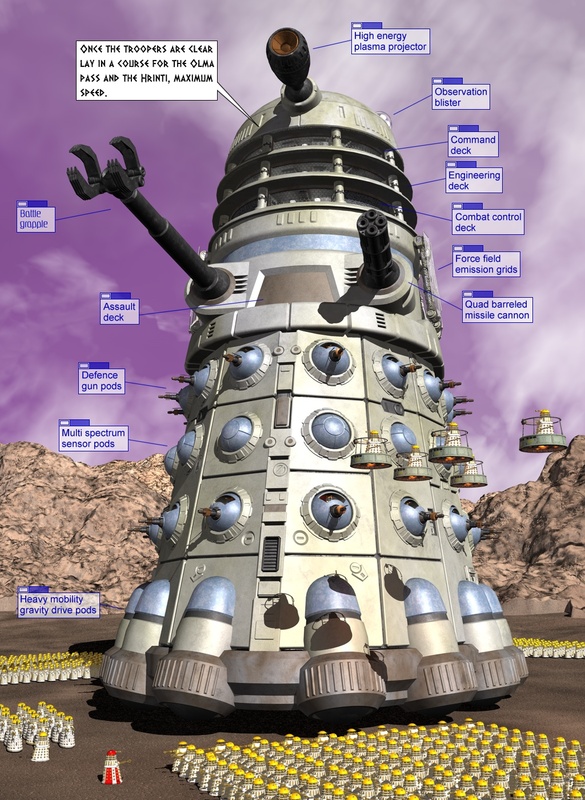 As the 2 armies closed things improved for the Dalek force at close quarters the firepower started to tell as tanks were stunned and in combat after the first squad of daleks went down (only to ressurect as part of the second squad moments later) to the command squad a blue box appeared, an angry timelord climbed out and killed the guard command. 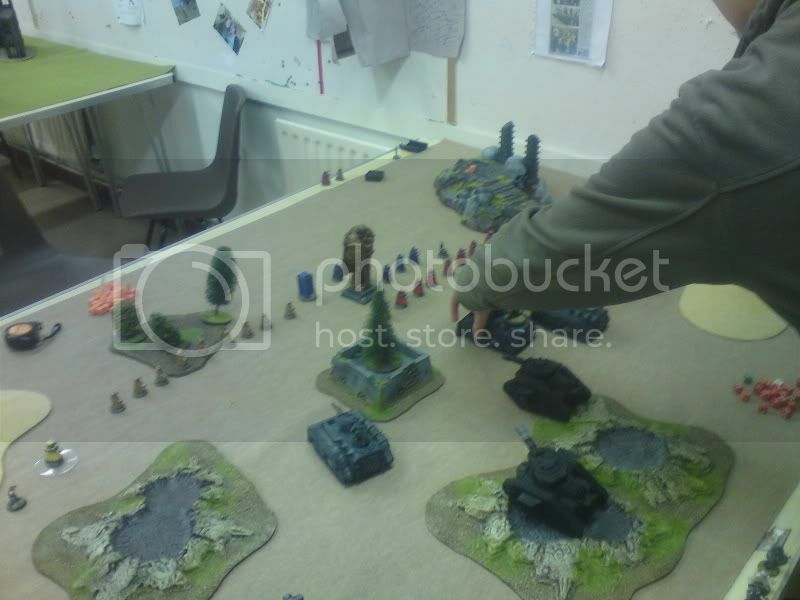 Meanwhile Davross was scrap metalling some of the chimeras (Warscythes are brutal!) 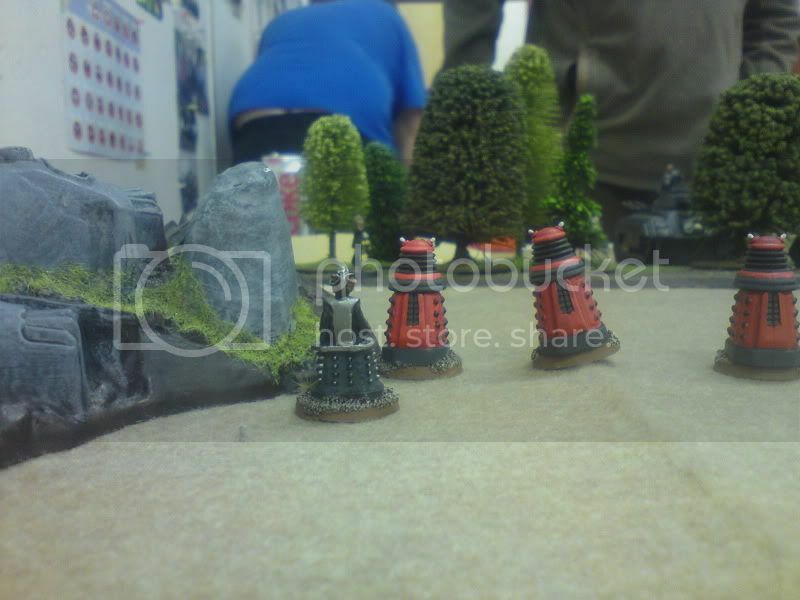 In a valiant attempt to stop the inevitable the 1st guard troops crawled out of the wreckage of thier transport only to be pounced upon by the doctor and 5 dalek troopers (pariahs) who killed over half the squad and sent them running for safety. 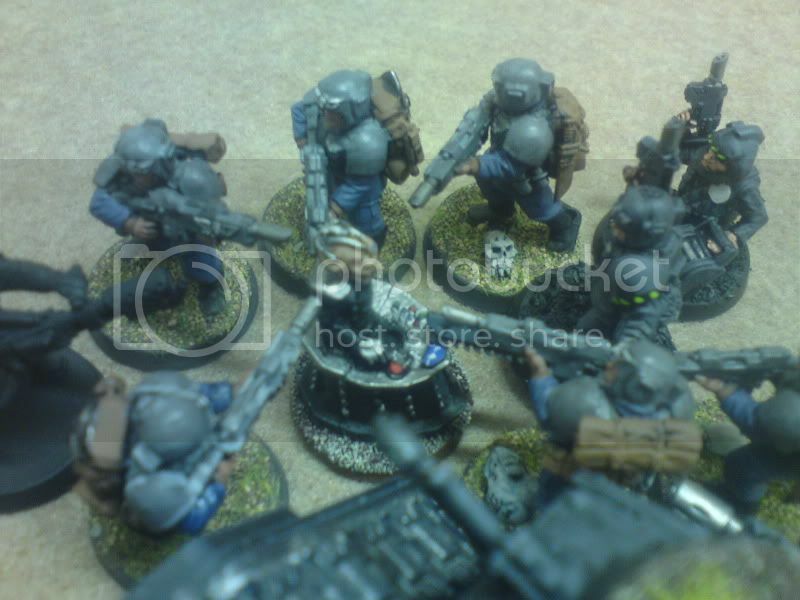 The second squad of guard climbned out of thier shaken tank just before the Doctor blew it up with a wave of his sonic screwdriver, only to have Davros plough into them. After a fairly inconclusive round of combat (2 dead guard) the presence of the nearby pariahs helped make the guard run, only to be mowed down by the crippled Kaled scientist! 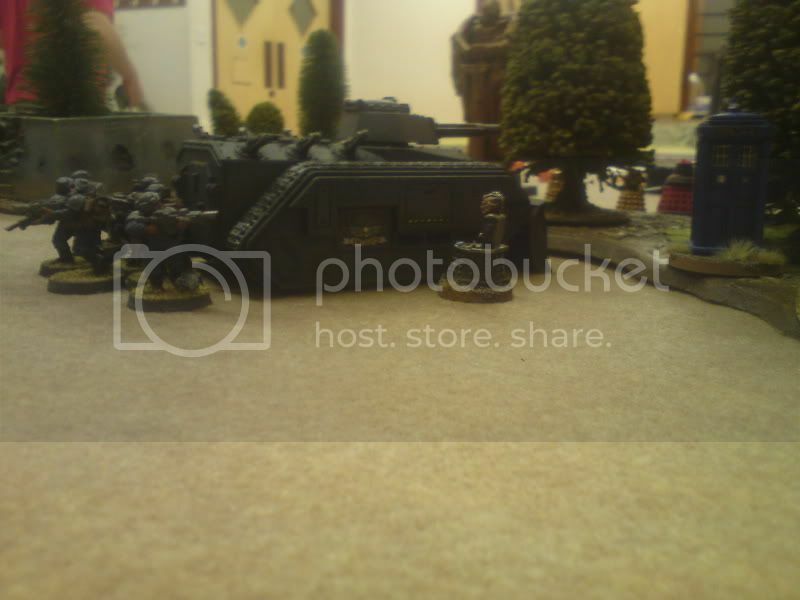 This was pretty much end game, the only thing left on the guard side was a leman Russ vanquisher(? may have been an exterminator.. it was a chuffin' big tank hunter, with a chuffin' big gun!) which kept knocking over a heavy destroyer (within res orb distance) who kept getting back up again. 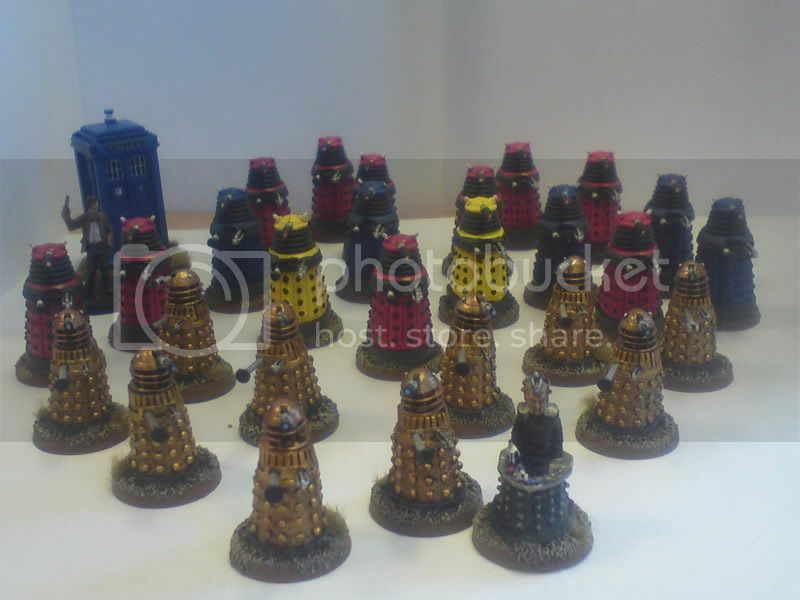 The daleks had the objective and the Doctor and Amy retired to the tardis for a well deserved bowl of fish fingers and custard! Safe in the woods, but what's on the other side of the trees? 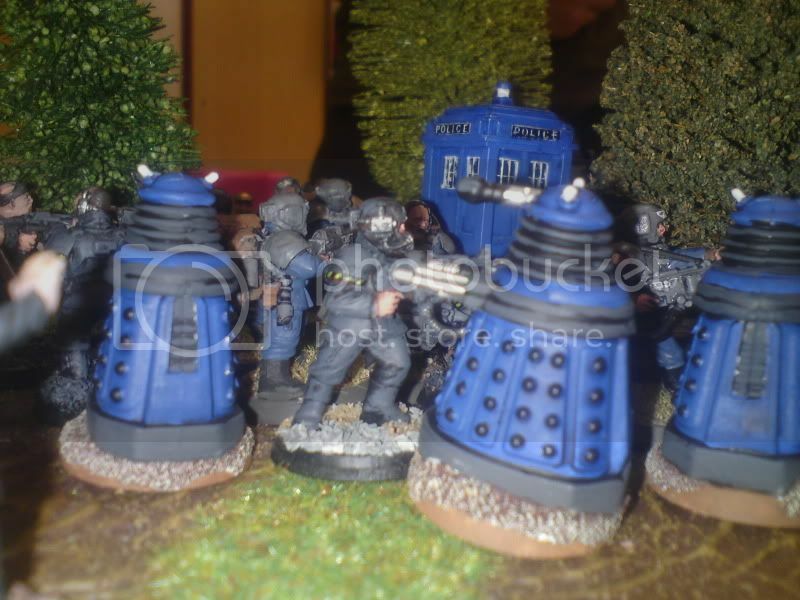 The last unit of guard have jumped out of thier disabled chimera as the Doctor moves in to finish the tank off with his trusty sonic screwdriver. 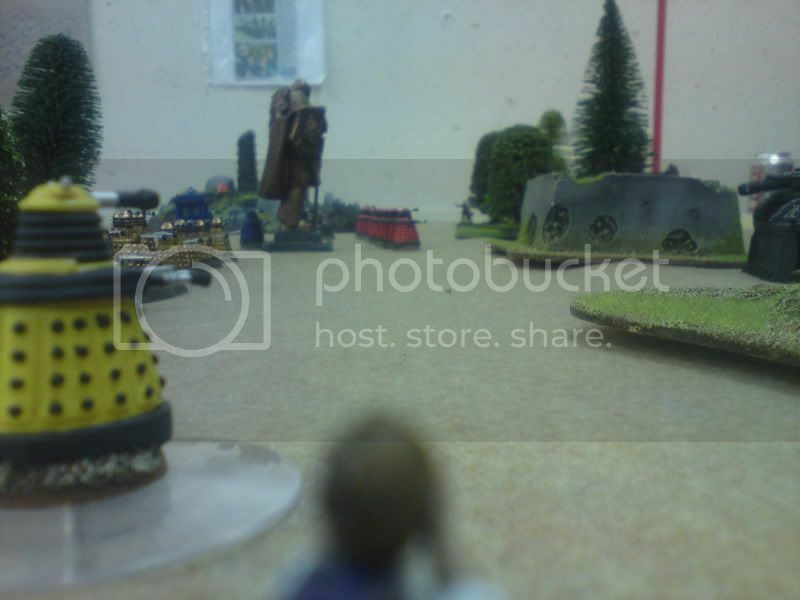 Davros informs him that he can deal with the guard on his own, ignoring the timelords pleas for him to show some mercy! 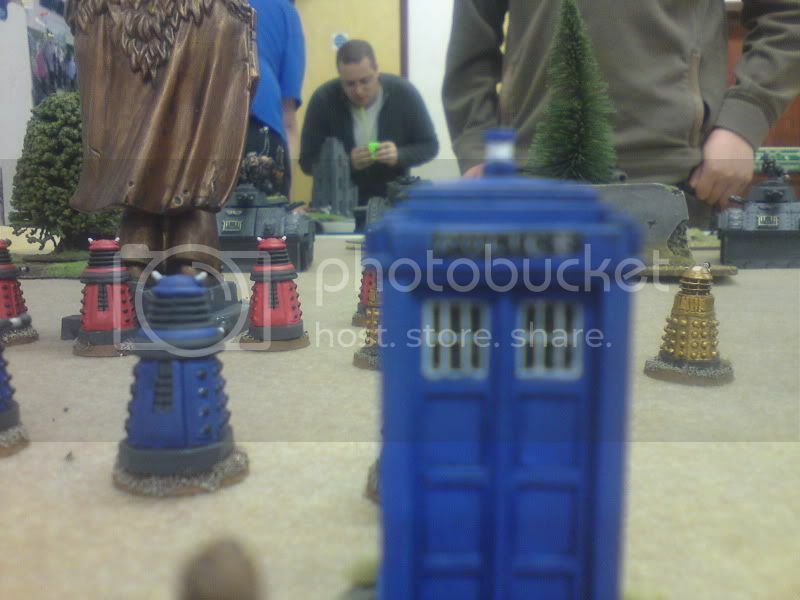 And finally Davros readies the nasty weapon wired up to his big red button as the guard surround him! 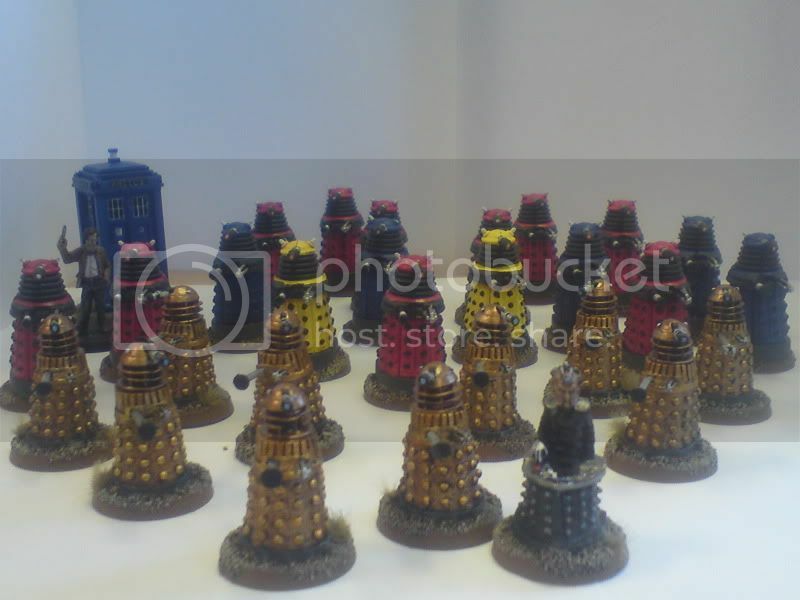 Loving the Daleks, though are you still not having any 40K fun? Still think its a rubbish game? This reminds me of a model of one (full size) that used to be in the porch of my grandads neighbours (at Finstock near Oxford)...I wonder if its still there? Also there is a new unit of uber pepper pots of doom ready to take to the field of battle tonight... what shall i use as objectives though?!?!?! Another victory!?!? Whoda' thunk it? Just need to scratch build a Monolith for next month now... To Poundland for some frisbees and ping pong balls!